Éirígí (Irish pronunciation: [ˈeːɾʲiːɟiː] or [ˈaɪɾʲiːɟiː], stylised as éirígí) is a socialist republican political party in Ireland, registered since 2010 to contest local elections only. The party name, "éirígí", means "arise" in the second person plural imperative in Irish, a reference to a famous speech by trade union leader James Larkin. It gained its first local councillors in 2009, when two former Sinn Féin councillors, Dungannon councillor Barry Monteith and Dublin City Councillor Louise Minihan, joined the organisation. Former Wexford county councillor for Sinn Féin and New Ross town councillor John Dwyer also joined éirígí. It failed to win any seats in the 2014 local elections, leaving it without elected representation. In early 2014 one of its members, Ursula Shannon, was convicted and sentenced to six years imprisonment after being charged under anti-terrorism legislation for possessing weapons and ammunition. Éirígí was formed by a small group of former Sinn Féin activists in Dublin on 24 April 2006, shortly before the 90th anniversary of the 1916 Easter Rising, as a political campaigns group. On 12 May 2007, at the party's first Ardfheis (conference), its members voted to become a full-fledged political party, and at its 2009 conference passed a motion to register as a political party in the Republic of Ireland. The party has become known for the use of nonviolent direct action and regular protests in Belfast, Dublin, and elsewhere. It has launched a mobile app aimed at telling people their rights when they are stopped by the police. Éirígí has organised protests against the visits of Britain's Queen Elizabeth and Princess Anne to Ireland. The party stood for election in Northern Ireland for the first time in the 2011 local elections, citing dissatisfaction with Sinn Féin's involvement in the Northern Ireland Executive, and claiming there was "a real appetite for a radical voice" in Northern Irish politics. It has never, however, stood for election to the Northern Ireland Assembly. The party seeks an end to British rule in Northern Ireland and the establishment of a 32-county republic based on socialist principles. Éirígí has participated in a range of campaigns, including Shell to Sea and Reclaim the Republic (which involved the organisation distributing 60,000 1916 Proclamations nationwide). The party opposes the Israeli occupation of Palestine, and supports the Boycott, Divestment and Sanctions (BDS) movement. The twentieth Independent Monitoring Commission report said the group is "a small political grouping based on revolutionary socialist principles". While it continues to be a political association, albeit with aggressive protest activities, it was not seen as paramilitary in nature. However, in November 2012, a prominent member of éirígí was arrested in County Offaly and remanded in custody for possession of two handguns and ammunition. éirígí campaigned for the United Kingdom to leave the European Union, describing the EU as "very much anchored in neo-liberal policies such as privatisation and austerity and programmes that have been enforced on countries such as Greece and Spain". It previously campaigned for a No vote in Ireland's Lisbon Treaty referendum in 2009. For its emblem, the party uses a green star as it incorporates both the national colour of Ireland and an international symbol of socialist struggle. The full national colours of the Irish Republic are achieved when the green star is combined with the word éirígí in the colour orange (signifying the cultural identity of some of Ireland's Protestants) set on to a white background. The éirígí's Ciorcal Náisiúnta (National Executive) is responsible for the day-to-day running of the party between meetings of An Ard-Fheis (General Assembly). It is elected by the membership annually on a 'one member – one vote' basis. Seven individuals are directly elected to national positions at An Ard Fheis. The chairpersons of each local branch are also members of An Ciorcal Náisiúnta. In the 2011 local election in Belfast — the only council the party contested during the local elections in Northern Ireland — the party stood in the Lower Falls and Upper Falls electoral areas, receiving over 2,000 first preference votes (10% plus), but failing to elect any councillors. The party unsuccessfully stood two candidates in the 2014 Belfast City Council election: Máire Drumm in the Collin electoral area, and Pádraic Mac Coitir in the Black Mountain electoral area polling a total of 1,756 (0.3%) first preference votes. The party also unsuccessfully stood three candidates in Dublin, two candidates in Wexford, and one candidate in Wicklow for the 2014 local elections polling a total of 3,120 (0.2%) first preference votes between all eight candidates. Sitting Councillor Louise Minihan failed to retain her seat. In November 2012, Ursula Shannon (Ní Shionnain), a Trinity College graduate and prominent member of Éirígí, was among four people brought before the Special Criminal Court in the Republic of Ireland charged under the Offences against the State Act with possessing weapons and ammunition including several handguns at Tullybeg, Co. Offaly, following an investigation targeting dissident republicans by the Garda Special Detective Unit. Brian Leeson, National Chairperson of éirígí, was also arrested in connection with the weapons seizure but was later released without charge. Brendan McKenna, éirígí's general secretary, confirmed Ursula Shannon was a member of the party and said the party would not take steps to distance itself from her. In February 2014, Ursula Shannon was convicted and sentenced to six years imprisonment for the charges. Shannon pled not guilty but did not challenge any of the evidence pertaining to the prosecution, with the court hearing that the accused were wearing balaclavas and disguises when they were intercepted by a team from the Garda Emergency Response Unit acting on confidential information, outside the premises of a licensed firearms dealer. The intention, according to the prosecution, was to steal firearms from the premises. One of the handguns recovered was linked by Gardaí to a murder in Tallaght in February 2002. The party's Newry press officer, Stephen Murney, was also taken into custody in November 2012 by the PSNI on terrorism charges for owning and publishing photographs of police officers on duty, though he was later cleared of all charges. ↑ "Clár na bPáirtithe Polaitíochta – Register of Political Parties – 23 March 2010". Houses of the Oireachtas. Retrieved 21 June 2010. ↑ "Bomb alert and protest mar royal visit". 21 March 2008. Retrieved 12 April 2014. 1 2 "Trinity graduate gets six years for possession of guns". The Irish Independent. 28 February 2014. Retrieved 2 July 2015. ↑ "éirígí Becomes a Political Party – Indymedia Ireland". Indymedia.ie. Retrieved 17 June 2010. ↑ "Campaign group now a radical political party". Irish Examiner. 26 May 2007. Retrieved 31 May 2016. ↑ "éirígí and Elections: an Exercise in Participatory Democracy". Eirigi.org. Retrieved 17 June 2010. ↑ "Dissidents linked to parade halt". 15 August 2009. Retrieved 12 April 2014. ↑ "Protestors invade Anglo-Irish HQ". 24 April 2010. Retrieved 12 April 2014. ↑ "Anti-austerity protesters chant insults at Irish minister Pat Rabbitte". 18 July 2013. Retrieved 12 April 2014. 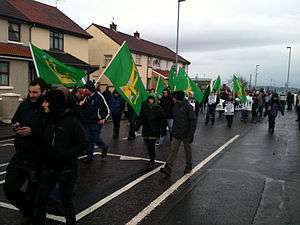 ↑ "Video: Eirigi among protestors in Enniskillen". 18 June 2013. Retrieved 12 April 2014. ↑ "Republican group Eirigi to launch app that tells people their rights when stopped by police". Belfast Live. 4 December 2015. Retrieved 31 May 2016. ↑ "Eirigi to stand in NI elections". 24 January 2011. Retrieved 12 April 2014. ↑ "éirígí: For A Socialist Republic". Eirigi.org. Retrieved 17 June 2010. ↑ "Israeli workers tell of fear at Gaza protests". 14 January 2009. Retrieved 12 April 2014. ↑ "Twentieth Report of the Independent Monitoring Commission" (PDF). October 2008. Retrieved 17 April 2012. ↑ "Éirígí activist one of four held on gun charge". ↑ "Éirígí backs Brexit with Northern Ireland poster campaign". The Irish Times. 30 May 2016. Retrieved 30 May 2016. ↑ "éirígí launch No campaign". Irish Democrat. 7 September 2009. Retrieved 31 May 2016. ↑ "An Ciorcal Náisiúnta". Retrieved 31 May 2016. ↑ "Statement of Persons Nominated and Notice of Poll for the District Electoral Area of Lower Falls". Belfast City Council. 7 April 2011. Archived from the original (pdf) on 17 April 2011. Retrieved 17 April 2011. ↑ "Statement of Persons Nominated and Notice of Poll for the District Electoral Area of Upper Falls". Belfast City Council. 7 April 2011. Archived from the original (pdf) on 17 April 2011. Retrieved 17 April 2011. 1 2 "Republican group Éirígí to take on Sinn Fein at polls". The News Letter. 25 January 2014. Retrieved 10 April 2014. ↑ "Trinity graduate wearing wig and disguise when intercepted by armed gardai, court old". 30 January 2014. Retrieved 27 February 2014. ↑ "Éirígí press officer bailed over photos". 29 January 2014. Retrieved 27 February 2014. ↑ "Éirígí press officer Stephen Murney cleared of terrorism charges". 24 January 2014. Retrieved 27 February 2014.